Mary Gedaka scored her 1,000th career point on Friday. Brianna Herlihy had only connected on five three-pointers the entire season. Emily Esposito had never started a college game and had never taken more than 10 shots in a game. Both of them decided to flip the switch on Friday night, leading Villanova over Old Dominion, 86-81, at Finneran Pavilion in the first round of the WNIT. Trailing 69-66 with 1.8 seconds remaining in regulation, Herlihy got her defender to bite on a pump fake, freeing up enough space for one final shot. It was the dream of every kid who has ever shot around in their driveway, she said later. Herlihy notched a double-double with 20 points and 11 rebounds, both career highs. Esposito, a redshirt freshman, filled in for the injured Kelly Jekot, the team’s second-leading scorer, for her first career start. Down 15-12 early in the second quarter, Esposito scored 11 straight points -- nine from deep -- for the Wildcats, putting pressure on a Monarchs defense that was daring Villanova to shoot. Esposito scored 27 points on 10-of-21 shooting, including 7-of-14 from three-point range, all career-highs, to lead the Wildcats to a second round matchup on the road against West Virginia on Sunday. But Villanova (19-12, 9-9 Big East) could never pull away. Eventually, Old Dominion (21-11, 10-6 Conference USA) rolled out to a 63-54 lead with 4 minutes, 57 seconds remaining. “We just kept grinding it out," said Villanova coach Harry Perretta. “If we lost, we would have lost. But we kept grinding it out the best we could, and luckily they missed enough shots to where we could get it and make a shot to tie it. ... It’s a great game for our seniors, but it’s also a great game for our underclassmen to get some experience in being primary players instead of secondary players." 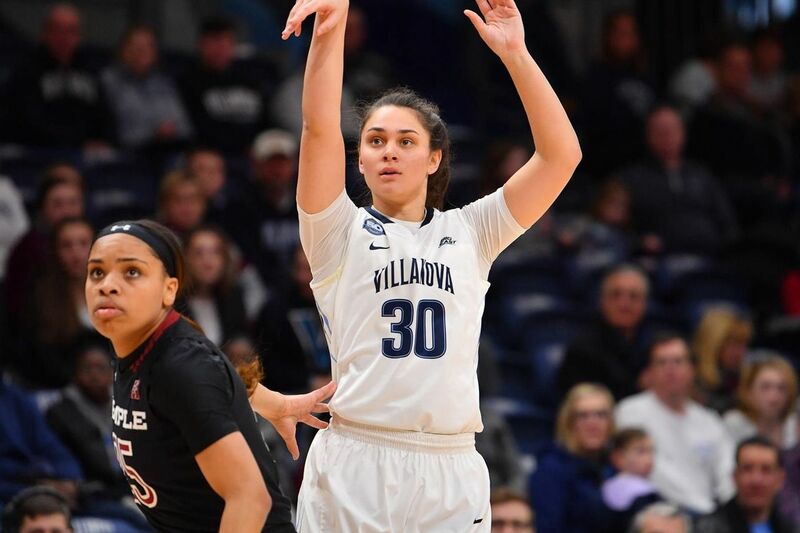 Villanova strung together a couple of defensive stops in a row, and Mary Gedaka scored on a wide open inbounds play with 19 seconds left to send the team to within one before Old Dominion sank two free throws. Gedaka scored her 1,000th career point in the process and became the 29th player in team history to do so. Mary Gedaka joins her mother, Lisa Angelotti, as members of the 1,000 point club. Together the duo have combined to score 2,632 career points. Mary Gedaka just missed a triple-double with 18 points, nine assists and eight rebounds. The Wildcats scored nine unanswered points in the first three minutes of overtime to seal the win. For Old Dominion head coach Nikki McCray-Penson, Villanova’s three-point shooting turned out to be too much compared to her team’s preferred style of play of taking the ball inside for layups and foul shots. The win not only adds one more game to Villanova’s schedule, but it extends the careers of seniors Grace Stant, Adrianna Hahn and Jannah Tucker. HALF: Villanova trails Old Dominion, 29-26. Despite shooting just 30% from the floor, 'Nova has connected on 6 three-pointers, four of which are courtesy of Emily Esposito. In a game that could be three seniors' last, the redshirt freshman is trying to make sure it's not.